It is a common mistake to see the root of the conflict between Palestinians and Israelis as grounded in the different belief systems. Obviously with the expansion and strengthening of fundamentalist movements on both sides during the last decades the conflict that is essentially about control over land is more and more couched in religious rhetorics. At the heart of this battle of Muslims versus Jews which increasingly fuses with that of Palestinians versus Israelis we find one incomparably significant place: Muslims refer to it as Haram ash-Sharif, Jews call it Har ha-Bayit, both of which is generally translated as the Temple Mount of Jerusalem, a place that probably constitutes the most contested religious site in the world. 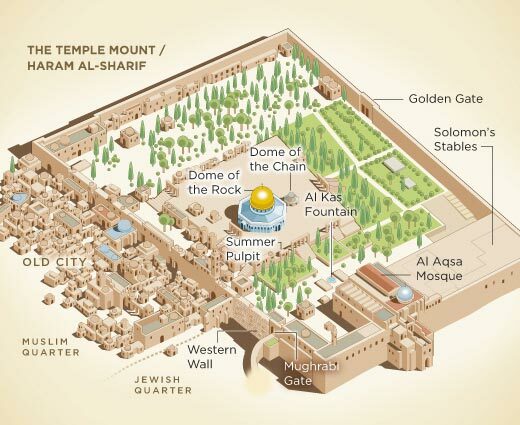 The Haram ash-Sharif, the Noble Sanctuary, contains both the sliver domed al-Aqsa Mosque, as well as the golden Dome of the Rock and constitutes the third holiest site of Islam, after the Masjid al-Haram, the Sacred Mosque in Mecca and the Masjid an-Nabawi, the Mosque of the Prophet in Medina. The al-Aqsa Mosque is furthermore believed to be the second oldest house of prayer constructed after the Masjid al-Haram in Mecca. "Praise be to Him who made His servant journey in the night from the sacred sanctuary to the remotest sanctuary." 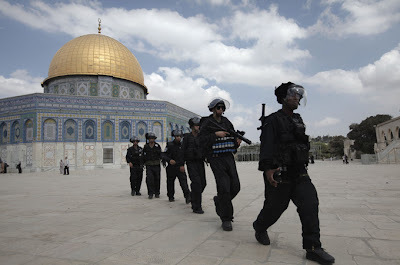 The "sacred sanctuary" is undoubtedly identified as the Masjid al-Haram in Mecca, and the "remotest sanctuary", though nowhere explicitly specified, is generally believed to be the al-Aqsa Mosque. As the story goes, Muhammad tied Buraq to the Western Wall and went to pray at al-Aqsa Mosque. He was then taken by Jibril (Gabriel) to heaven, where he encountered Abraham, Moses and Jesus and led them in prayer. 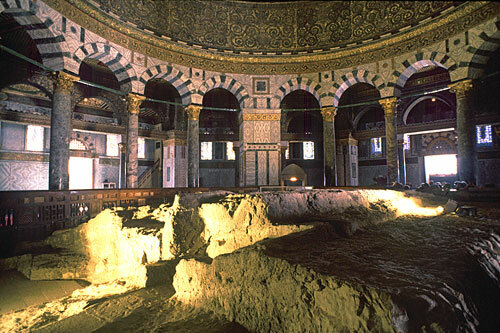 Many Muslim scholars believe that the Foundation Stone within the Dome of the Rock is the site from which Muhammad and Jibril ascended to heaven. Al-Aqsa is further very significant to Muslims, as it constituted the first "qibla" ("direction") that Muslims faced for prayer. Only after he had a revelation during prayer, Muhammad started praying towards the Ka'aba in Mecca, which constitutes the qibla up to this day. The Har ha-Bayit, as the Temple Mount is referred to in Hebrew, constitutes the single most important site in Judaism. The holiest site on the Temple Mount is the Foundation Stone, located at the heart of the Dome of the Rock, which according to traditional Jewish belief constitutes the spiritual junction of Heaven and Earth. According to the Talmud the world as we know it expanded from this very place with the rock itself being the first part of the earth. It was also close to this rock where God created Adam out of dust, where Abraham offered his son Isaac as a sacrifice and around which the two Temples were built. Not directly on the Temple Mount, but at the foot of its western side, we find the Western Wall, the only remnant of the Temple, more specifically of the wall that surrounded its courtyard. According to rabbinic opinion the Western Wall constitutes the closest permitted accessible site to the Holy of the Holies, identified as the Foundation Stone inside the Dome of the Rock, which is believed to have constituted an inner sanctuary of the Tabernacle and later the Temple, where the Ark of the Covenant containing the Ten Commandments, was kept. Due to it being the most sacred site in Judaism, Jews all over the world face towards the Temple Mount when praying. Obviously it is also here where the Temple should be rebuild a notion that is specifically contentious, considering the importance of the site to Muslims. To Christians the Temple Mount is significant due to the role it played in Jesus' life, as it was here where Jesus issued his challenge against the Temple authorities, an act which can be seen as leading directly to his arrest and crucifixion. During the Crusaders' time both the Dome of the Rock and al-Aqsa were converted to churches for a brief time, yet in general the site does not hold such great significance if compared to others in the Holy Land. 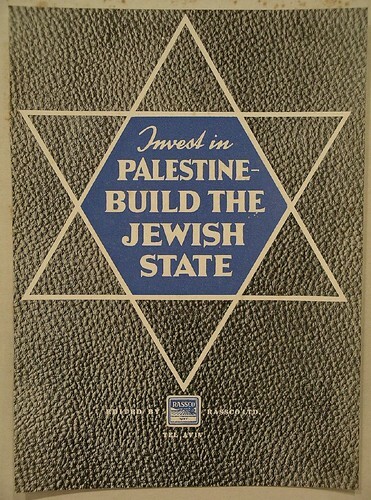 In accordance with Judaism, some Christian Zionists believe that the Third Temple must be rebuilt on the site of the Foundation Stone to prepare for the Second Coming. This notion is specifically contentious as it entails the destruction of the Dome of the Rock, also advocated by some Jewish extremists. The management of the Temple Mount has been in the hands of an Islamic Waqf since the Muslim reconquest of the Kingdom of Jerusalem in 1187. Also after Israel took control over East Jerusalem during the Six-Day War in 1967, the holy site continued to be administered almost exclusively by the Waqf. According to Israel's Preservation of the Holy Places Law, holy places have to be protected and freedom of access has to be ensured. Yet due to the omnipresent question of security, Israeli authorities frequently curtail the right to worship and restrict access to the site of especially Palestinians from the West Bank (who in any case need a permit to enter Jerusalem) to men over 35 and women of all ages. The pretext for those restrictions is usually the threat of riots and the safety of worshippers at the nearby Western Wall. 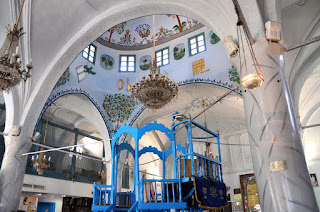 As already mentioned above, access to the site for Jews is prohibited according to interpretations of the Torah and the Chief Rabbinate of Israel, which deem the site off limits to Jews due to its holiness. However, a growing number of Modern Orthodox and national religious rabbis encourage visits to certain parts of the Temple Mount. Some of those activists even demand the construction of a synagogue at the site and resort to arguments of equal right to access and worship and charge the Waqf administration which forbids non-Muslims to pray or to display religious symbols at the site with discrimination. Notwithstanding the pressure by those movements, most Israeli politicians to date did not submit to those demands, out of fear of the sparking of unprecedented riots and conflict. The sensitivity of the issue of access to and appropriation of the site is evidenced in history as it was frequently used to fuel strive. 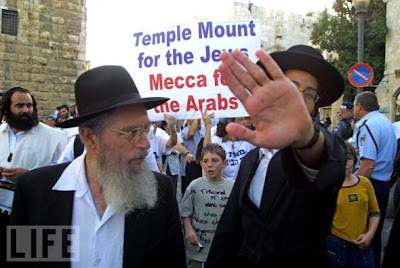 Already before the foundation of the State of Israel, the Grand Mufti Hajj Amin al Husseini managed to mobilise widespread support against the Zionist movement by spreading rumours about Jewish intentions to take over the Muslim site. Similarly Ariel Sharon's notorious visit of the site in the year 2000 has been interpreted as the proverbial straw that broke the camel's back and triggered the outbreak of the al-Aqsa Intifada. Archaeological excavations at the site and its vicinity, as well as alterations undertaken by both the Waqf and Israel keep on sparking controversies and criticism by the respective other side and are frequently interpreted as cultural vandalism, attempts to take over the site and to deliberately damage evidence about the respective community's past of the site and commonly fuel protests by either side.